This post is sponsored by Sounds True, however, all thoughts and opinions are my own. This book sends the message that you don’t have to be a grown up to be a hero and that each day is full of opportunities to make a positive impact with ordinary actions . Our warrior goddess is connected to nature and keeps her body and mind strong. She’s loving and fierce. She helps others and is a leader. She’s self reliant and confident. It got me thinking…how can we teach our daughters to feel this way? How can we teach them that they don’t have to make a huge gesture, but rather inspire them to use ordinary actions to make a positive footprint in the world? How can we not only read this story to our children at night, but teach the valuable lessons that are embedded throughout? How can we make sure they help others? Become a leader? Be self-reliant? Have confidence? Well no worries my loves, I’ve got you covered. As a previous special needs kindergarten teacher, one of the things I loved more than anything was making a book come to life for a child. Teaching them how to connect it their real life, striving to make it meaningful, and using literature as a way to teach the important stuff. To that end, I’ve come up with 5 Ways to Empower Your Daughter with ordinary actions, inspired by I Am A Warrior Goddess. If you’re new here, let me tell you a little bit about my very own 3-year-old Warrior Goddess, Adeline Belle. Addie was born at 26 weeks, weighing only 1lb 8oz, and has fought for her life ever since. She’s had several life threatening situations, 12 surgeries, spent most of the first 2 years of her life in a hospital, is in early intervention for nearly everything, and at 3 years old, still has a feeding tube and is occasionally hospitalized. She is different than her peers, so it’s even more important to me that I teach her to love herself, teach her acceptance for her differences, and develop her confidence. As a child with a lot of illnesses, it’s easy to want to protect her, keep her safe, do everything for her, but its even more important to teach her to advocate for herself, to take care of herself, and to nurture her self-reliance. Here are the 5 Ways to Empower Your Daughter all inspired by this book, I Am A Warrior Goddess. Adeline and I recently started doing this, and the impact has been huge. How many people tell you how your daughter is beautiful? Cute? Or (a 1,000 people in Disney World) that she’s a princess. I don’t like the “princess” stigma. Addie doesn’t need rescuing, she slays her own dragons. It’s important that we’re not only mindful about the words we use to describe our daughters, but it’s also important we instill the positive self-talk we want them to use when they’re speaking to themselves. Affirmations are simply statements that are designed to create a change in the person using them. They can serve as great sources of inspiration or as simple reminders. Affirmations are written in the first person (I am…), they’re positive statements, taking place in the present state, (“I am” vs “I will be”), and have an emotional charge. 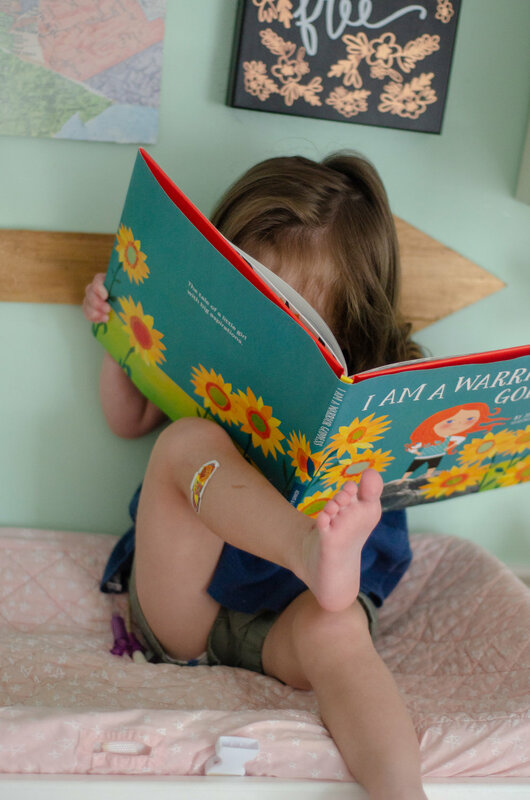 I Am A Warrior Goddess is a book filled with affirmations that are perfect to start practicing with your daughter in the mirror. To make it more meaningful for my toddler, we introduced this slowly, and did it multiple times. Each morning after she is dressed for the day, we go in front of the mirror to check ourselves out. This exercise only takes a minute and it’s very powerful. These words are also the same language I use with her throughout the day so she learns what these words mean. When I was having a bad day, I told her about it, and explained why. Addie was so kind, comforting me when I was sad, so the next morning we affirmed that in the mirror. I am kind and I help people when they’re sad. We’ve also been reading this book daily which helps to reiterate the lessons I’m trying to teach her. 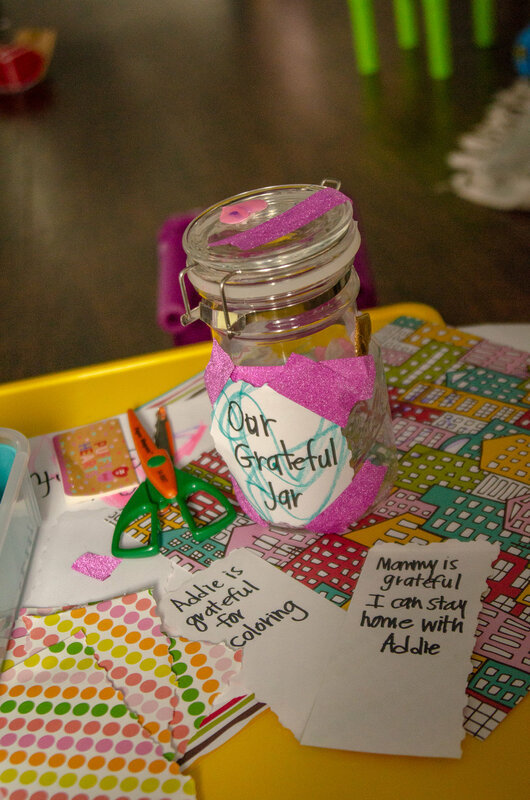 We purchased a jar with a lid from a craft store and we decorated the jar together. We used random stuff to decorate it; glitter tape, Halloween stickers, markers, and various items from the dollar bins at Target. We got some fun scrapbook paper, a few pens, and placed the jar in the center of our dining room table. 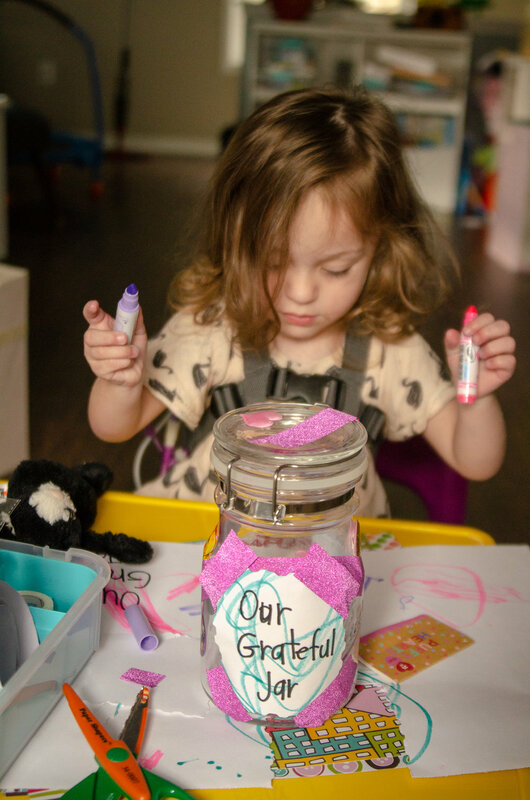 Each night at dinner, we take turns saying what we were grateful for, writing it on the paper, and putting it in the jar. We added this activity to a routine so that we would make sure not to forget to do it each day. Our plan is that on Thanksgiving, we will take turns picking cards out of the jar and reading them aloud. We work on her expressing gratitude to everyone, and have done so for a very long time. She thanks her teacher’s each day when she leaves school, the pharmacist for making her medicine, the people who clean her hospital room, and even the IV technicians after they draw her blood. We explain to her why each person deserves gratitude and appreciation. We also make her express gratitude to John and I at home; for giving her a drink, making her meals, helping her when she needs it, etc. Adeline is 3 years old, so at first she said “thank you” as more of a habit, but as she’s gotten older, and heard us explain why to her again and again, she’s starting to understand the reasoning behind it. This concept takes time and consistency, but is an important one. This past June, my husband & I made huge changes to our lifestyle and starting eating healthier, eliminated refined sugar, most carbs, and started to exercise. After some really stressful years with a child who had a lot of hospitalizations and health issues, we realized we weren’t taking care of ourselves. But just like the Warrior Goddess, you need to “train your body for battle’’ . You train your body for battle by eating right and exercising. We started taking care of ourselves, so that we could be better parents to Adeline and we want to teach her healthy habits too. That way, she can be empowered to take care of her body, her mind, her health issues, etc. We want her to prioritize her health, so that she can be a better contributing member of society. One of the ways we do that is by exercising together, and our favorite thing to do is hike as a family. Exercising as a family doesn’t mean you have to play a sport, or go to the gym, or run on the treadmill. You can go to a playground and play on the equipment with them instead of just watching, swim in the pool, play with the dog in the yard with a ball, create an obstacle course in the house, or even have a dance party. One of our favorite things to do, after our day is winding down, dishes are done, and we’re getting ready for bed, is to have a full-blown dance party. Need some help with music? I’ve embedded the I Am A Warrior Goddess playlist from Spotify. A few times a year, we give back to the hospital that took care of Addie for most of the first two years of her life. I involve her in gathering the items we’re going to donate, and she goes with me to the hospital to give out the donation. As Adeline gets older, this activity will expand. This can be done in a few different ways, but this is how we’ve done it in the past. At each birthday, she needs to give away the number of toys that corresponds with her age. At 3 years old, she had to pick 3 toys to give to the hospital for other kids to play with. At an autism event where I used to work, we had kids with autism put together care packages for kids who are in the hospital. They decorated cards, and filled bags with Play-Doh, crayons, etc. Adeline participated by handing them out to various kids in their hospital rooms. We teamed up with a small business, Sweet Beads and designed two teething necklaces called The Adeline and The Belle. For each necklace purchased, a book called The Zen Pig would be donated to 9 South, the unit Addie was always on. Adeline went with the small business owners Jade & Alex to deliver the books to the hospital. Other ways you can have your little one give back is to involve them in any sort of charity work you participate in. Maybe they collect cans for a food drive, drop off blankets to a dog shelter, visit the elderly at a nursing home, wrap a toy for a kid in need during the holidays, etc. For our situation, giving to the hospital is more meaningful for her as it’s been a part of her childhood. 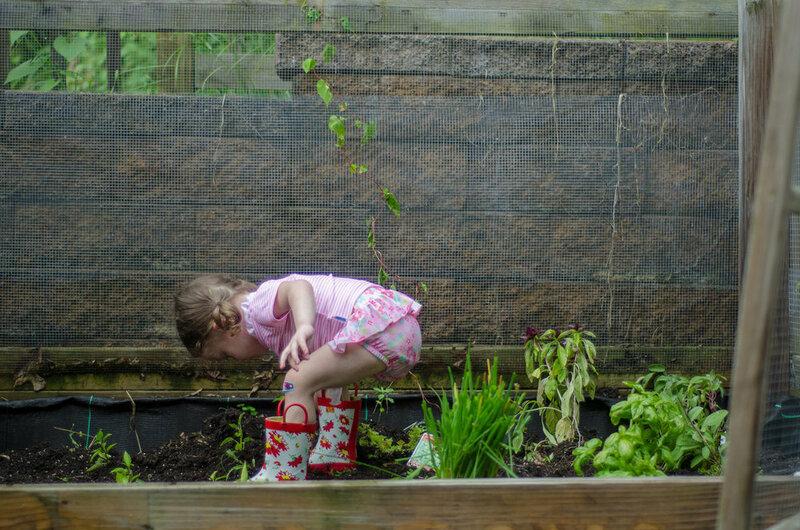 One of the ways we teach Addie to take care of the earth is through planting and maintaining a family garden. Having a garden helps the environment. On a very small scale, doing this contributes to the number of plants and trees on the planet. This in turn is very important because plants and trees convert carbon into oxygen. When you garden, you provide a habitat for lots of lifeforms and you encourage birds and insects to thrive and to reproduce. It reduces pollution, reduces your carbon footprint, and teaches healthy eating habits. As some of you may know Adeline has a feeding tube, TPN, oral aversion, so eating is pretty complex. But seeing and being involved in the process from seed to plant has helped her be more eager to try new foods. Each night, we offer AB a vegetable and she won’t generally eat it. But after planting her own tomatoes, she’s tried them twice! in the story, I Am A Warrior Goddess she shows appreciation for the earth each morning and evening, she plants flowers, and waters them. 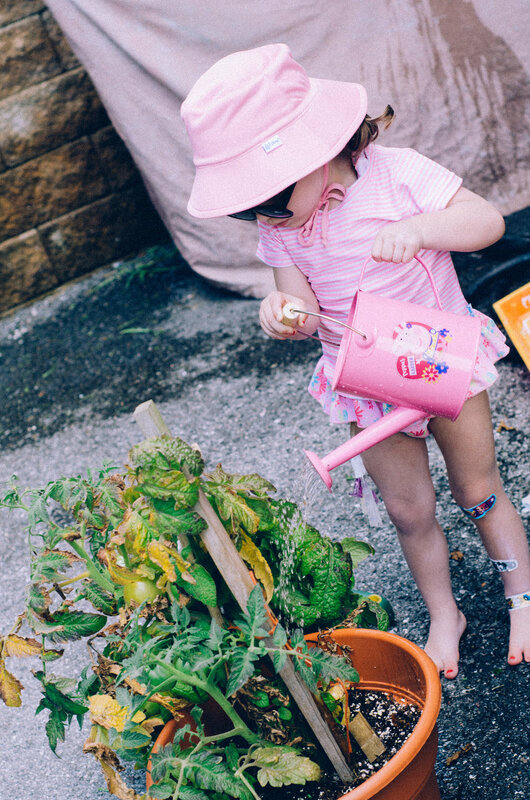 While the initial creation of a garden is a lot of work, once it’s created, the day-to-day care can be quite ordinary. 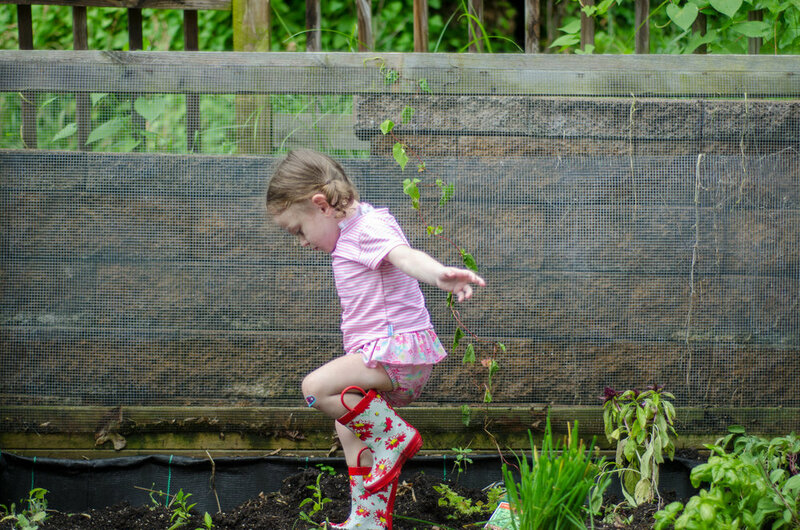 Addie would help us water, pick weeds, trim herbs for dinner, and add food to our compost bin. 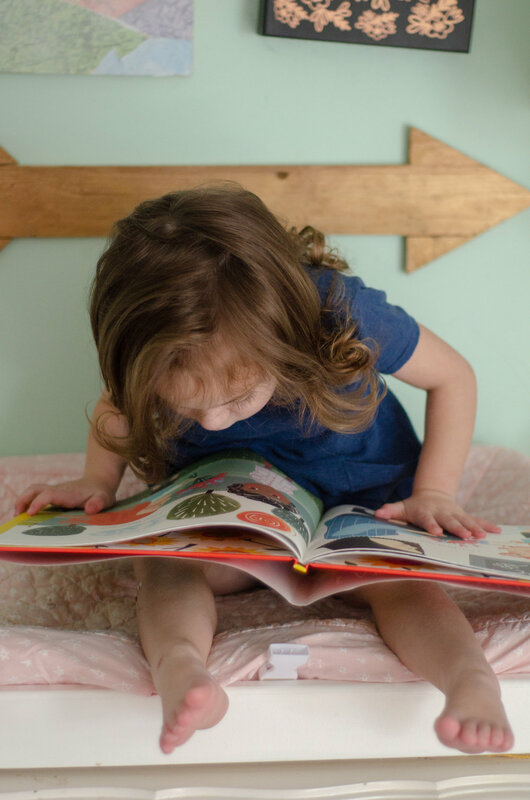 Sounds True has come up with their very own Story Kit which includes 6 activities to help empower all the little girls in your life. This kit comes with coloring pages, print outs, gratitude cards, and ideas on how to reinforce the valuable lessons in the book. You can get your very own book from Amazon or other book stores, but when you purchase this book from Sounds True website (same price as Amazon) you will also be able to get a free I Am A Warrior Goddess t-shirt!! One last thing is that for every book purchase, they will donate a book (up to 300) to children's hospital foundations!